Jaipur : After enabling an enriched Digital Life experience for over 175 million Jio Prime Members, Jio now brings another bonanza for its existing Prime members. All Jio Prime members who have subscribed to the exclusive membership benefits till 31st March 2018, will get another year of complimentary Prime benefits at No additional fee (limited period offer). It means that the all existing Prime members will go continues till 31st March of 2019. Jio deeply values its loyal Prime members and will continue to deliver additional benefits and superior value to these founding members. For new Jio users, the Jio Prime Membership continues to be available at an annual membership fees of Rs 99. The continued availability of the Jio Prime Membership to new subscribers reiterates Jio’s commitment to deliver a differentiated Digital Life experience to Indians and will propel this into the world’s largest loyalty programme. With the on-going augmentation of content offerings and consumer engagement programs, Jio is gearing up to bring new and superior experiences with the Prime program and will ensure that Prime members get substantially better benefits than the counterparts in the industry. Step 1 : Download MyJio. Step 2 : Express your interest to get COMPLIMENTARY membership for next 12 months. 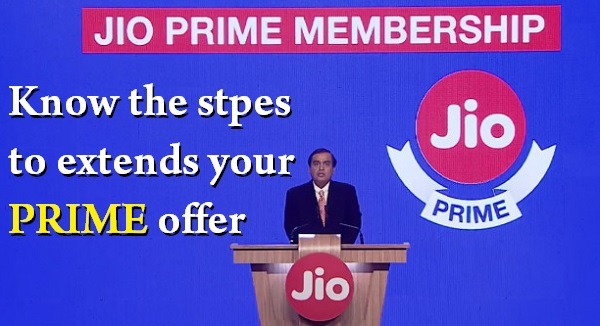 Step 3 : Thats it, Now you can enjoy another year of Jio Prime benefits. - You need to just Pay Rs. 99 during on-boarding, for Jio Prime membership for annual subscription.